The arrival of Spring means insect pests are just around the corner. One pest to watch out for is the Boxwood Leafminer (Monarthropalpus flavus). Although boxwood tend to have few pests, the leafminer can be a headache for growers. Damage starts small with some discolored leaves, but as populations build over a period of years, you will see defoliation, and in severe cases, plant death. Luckily, there are effective options to combat this pest. Boxwood Leafminers are tiny, orange, gnat-like midges that have only one life cycle per year. 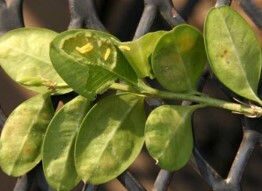 The cycle begins each spring as the previous year’s larvae cause the boxwood leaves to blister and swell. Those larvae pupate and emerge as adults in April/May (Central Virginia). After pupating, the adults hover only inches above the boxwood because they are weak flyers and wind will blow them away. Over a 3-week period, adults emerge in waves to mate. Females complete their life cycle after they lay their eggs in the tender leaves. These eggs hatch in early summer (mid-June) and the larvae begin the cycle of growth that will conclude the following spring. Saunders Genetics has done extensive work trying to determine the best timing and chemicals to control Boxwood Leafminer. In many programs, sprays are targeted towards adults, but because leafminer emerges in waves, you would need to spray every 2-3 days over the 3-week period, making it nearly impossible to eradicate them. Instead, control can be achieved with a single spray of a systemic insecticide after eggs hatch (mid-June). These types of insecticides remain effective until temperatures turn cold in the fall. When a spray is applied properly and thoroughly to all boxwood in a given area, you can receive control for up to 2-3 years. According to research, the most effective products are those that contain the active ingredient imidacloprid, thiomethoxam, or dinotefuran. Please note that Saunders Genetics bases this recommendation on in-house trials. We recommend growers and landscapers contact their local Extension personnel for recommendations and regulations in their area. Although chemical control is a great option, there are also boxwood varieties available that have shown genetic resistance to Boxwood Leafminer. Saunders Genetics has done thorough research, testing over 129 cultivars. The results are listed in the chart below. Genetic resistance is a defining feature in the NewGen™ Boxwood program. The goal of NewGen™ is to provide grower-friendly plants that can thrive when faced with pest and disease pressure. NewGen™ boxwood were chosen because they are more resistant to Boxwood Leafminer than many of the varieties currently on the market. If you are replacing or planting boxwood, look to these NewGen™ varieties which will be available for purchase in 2020. Easily one of the most recognized garden plants, boxwood (Buxus sp.) have been gracing formal gardens for thousands of years and are considered one of the oldest ornamental plants. As slow-growing evergreen shrubs, these plants have always been a symbol of a gardener’s commitment and investment to a green space. Boxwood have held their reputation for many years because they are low maintenance, provide structure to a garden, and have few pests and disease pressures.Unfortunately, this reputation took a hard hit in 2011 with the introduction of Boxwood Blight in the U.S. and many growers became concerned about the beloved plant. Saunders Brothers in Piney River, VA, a family-run nursery with a rich history of boxwood production, responded to this threat by investing in research to find a solution. Their experience in trials for resistance to Boxwood Leafminer, helped them to work with researchers and universities to begin testing for varietal tolerance of Boxwood Blight. After testing over 150 varieties, it was clear certain varieties excelled. Saunders Brothers was excited to have found solutions to a potentially devastating disease. They felt they needed to share these genetics with the industry. This sparked the creation of NewGen™ Boxwood. NewGen™ aims to be the standard bearer of a distinctively better family of boxwood. This new generation of plants promises better tolerance of Boxwood Blight, better resistance to Boxwood Leafminer, and a WOW factor in the landscape. By maintaining bio-secure testing methods and standards, we hope to continue making introductions of superior plants that maintain brand standards. We aim to establish a regional network of premier licensed growers and propagators to share these plants in landscapes all over the United States. We will dedicate 2019 to introducing the program to the industry and its customers, building production on our two initial selections. Plants are scheduled to be available for sale in the spring of 2020. At this time, we are partnering with 4 growers to distribute the product line: Overdevest Nurseries, NJ; Prides Corner Farms, CT; Saunders Brothers Nursery, VA; and Willoway Nurseries, OH. NewGen™ Boxwood intends to raise the bar for boxwood to meet the changing dynamics of a new generation of the American garden and gardener. Pictured is the NewGen™ team, Lindsay Day (left) Marketing Coordinator and Bennett Saunders (right) General Manager of Saunders Genetics.